Pakistani officials dismissed a top American counterterrorism official's claim of progress in the hunt for Osama bin Laden, saying Pakistan does not have any information on the al Qaeda leader's whereabouts. The top government spokesman, Sheikh Rashid Ahmed, said the recent comments about bin Laden by J. Cofer Black, the U.S. State Department coordinator for counterterrorism, were a "political statement." "We don't have any information about bin Laden," Ahmed said Monday. A senior Pakistani security official who attended meetings with Black and other U.S. officials last week in Islamabad said Black did not share information "about any possible hideouts of Osama." "We cannot say that we are close to capturing him," the official said on condition of anonymity. Black told the private Geo network in an interview broadcast Saturday that if bin Laden "has a watch, he should be looking at it because the clock is ticking. He will be caught." Asked if concrete progress had been made during the last two months in capturing the world's most-wanted fugitive, Black said, "Yes, I would say this." 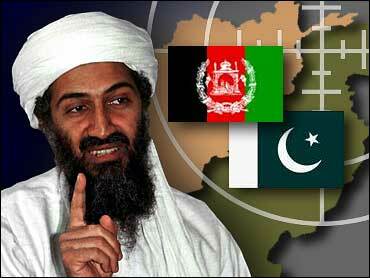 Black said he could not predict exactly when bin Laden and other top al Qaeda fugitives would be nabbed. Ahmed said Black "may have this information, but we do not have any such thing." Although he described Black's comments as a "political statement," he said he was not implying that Black's comments were connected to November's U.S. presidential elections. Pakistan is a chief battleground in the U.S.-led war on terrorism. Bin Laden and his chief associate, Ayman al-Zawahri, are believed to be hiding in the lawless tribal regions flanking Afghanistan. Pakistan has deployed about 70,000 troops along that border, hunting al Qaeda holdouts sheltering on Pakistani soil and ordering military offensives in areas where officials say foreign militants set up terrorist training camps. Authorities also have made a series of high-profile terror arrests in Pakistani cities. The prisoners include Mohammed Naeem Noor Khan, an alleged al Qaeda computer expert, and Ahmed Khalfan Ghailani, a Tanzanian suspect in the 1998 bombings of U.S. embassies in east Africa that killed more than 200 people. Both suspects have provided investigators with leads that triggered a terror alert in the United States and a series of arrests in Britain. Militants angered by President Gen. Pervez Musharraf's support of Washington have carried out a wave of terror attacks in Pakistan this past year, including two assassination attempts on the president in December and a suicide bombing that nearly hit new Prime Minister Shaukat Aziz in July. Pakistan was once a supporter of the Taliban regime. On Monday, Musharraf courted more controversy by strongly indicating that he plans to stay as army chief next year to help maintain national stability during the anti-terror campaign — just eight months after telling the nation he would be standing down. Musharraf, who took power in a bloodless coup in 1999, claimed the vast majority of Pakistanis wanted him to keep his military position, which is viewed as the source of much of his power. "You should ask them (the people) should I leave uniform or not. You will meet 96 percent of people who will say (I) should not leave it," the army chief told the private ARY TV network. He warned that the terrorism posed an enduring threat to Pakistan. "An upheaval is going on and it will keep going on for some time. We have to bring it under control," he said. Political opponents accused Musharraf of reneging on a nationally televised promise that he would give up his army chief post by Dec. 31. Sadique al-Farooq from the Pakistan Muslim League-N party said Musharraf's claim of 96 percent support was a "hallucination" based on his "personal interests and lust for power." The U.S. has rewarded Pakistan's cooperation by lifting sanctions imposed after the 1999 coup and following Pakistan's testing a nuclear device in 1998.